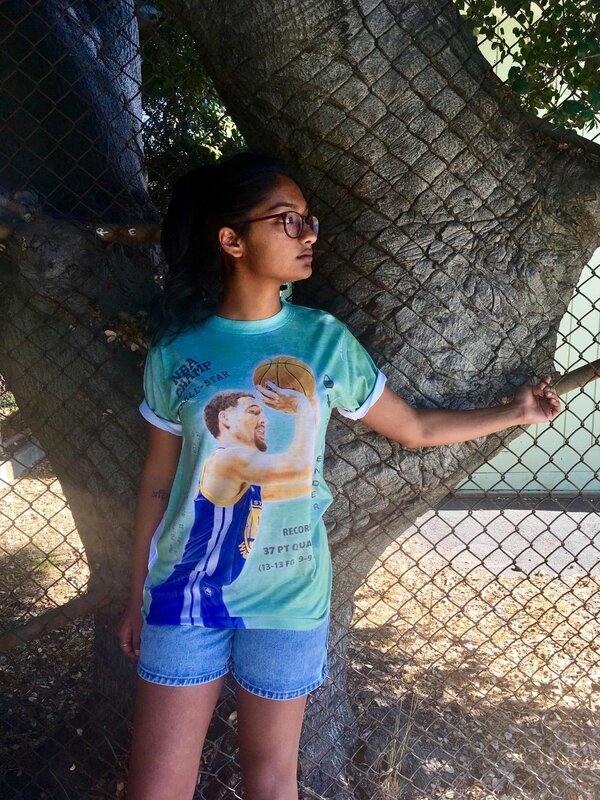 "Made With Klay," the 4th in the wearable sublimation print series, is a color pencil drawing through and through. Completing the series of the Warriors "Big 4" stars, I wanted to celebrate Klay's often overlooked talent and incredible statistical achievements thus far in his young career. The 37 point quarter on perfect shooting from the field, his 60 point game in only 29 minutes played, his underrated defense, his Olympic Gold Medal. As usual, in my stubbornness to rely on the original drawing, and as little editing as possible for the shirt, I lettered it all by hand in grey color pencil over my graphite outline. First, I settled on a green (with blues and yellows mixed in) background, inspired by the SF Chronicle Sporting Green I grew up reading. To create the wash texture, I added baby oil to the color pencil I layered, smeared around with cotton balls and let dry. The dark grey print always looked good to me on the green newsprint paper with the headlines from the previous night's games. 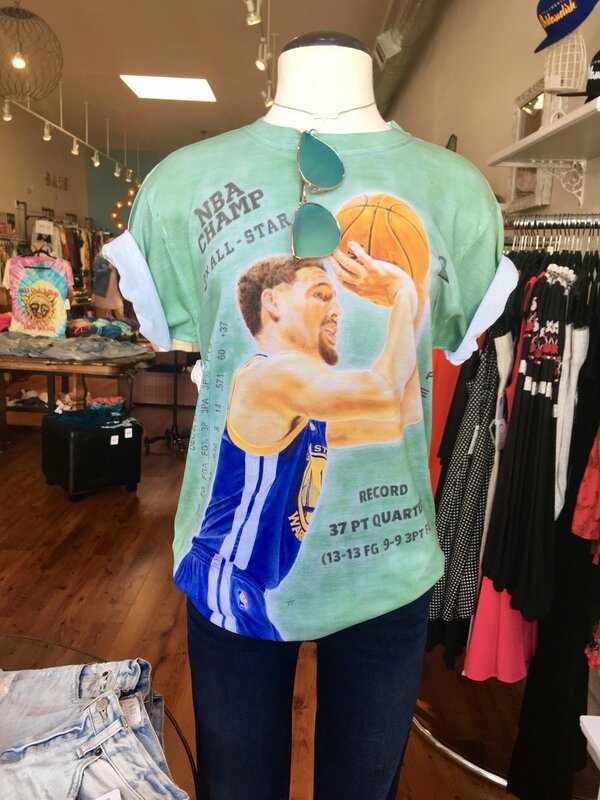 As I tossed around other potential background ideas, I also realized green was the only color that could surround Klay's skin tones, the blue and yellow of the Warriors road uniform and the orange ball. Another major challenge was drawing his shorts without them in the reference photo, instead I used one of him in the home white uni in a similar position, eyeballing the wrinkles, colors and values to be as accurate as possible. As usual the placement is the greatest puzzle piece in the final product, and I feel this drawing is perhaps the most high stakes and well executed, as no lettering was moved in post photography, each graphic taking the perfect place on the torso when worn. With the experience from previous projects, each successive one presents new technical and graphic challenges. 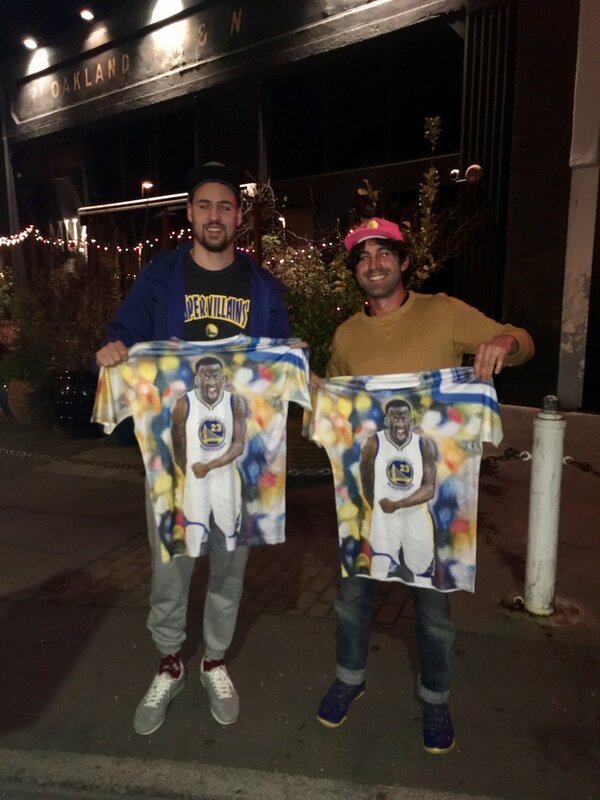 As the Warriors took down the Cavs two weeks after release, the drawing and shirt were updated to feature "2x Champion"